What is an apicectomy? What actually happens during an apicectomy? Why is an apicectomy performed? Is an apicectomy painful? An apicectomy is a minor surgical dental procedure performed on the root-end of an infected tooth. Literally, it means removal of the tip of the root. Radiograph demonstrating inflammatory lesion associated with the root tips of the upper right central and lateral incisor. The lesions and associated symptoms persisted after root canal retreatment. Why is an apicectomy performed? An apicectomy is performed on a tooth when the root canal treatment (or root canal retreatment) has been unsuccessful and consequently the inflammatory lesion associated with the root-end persists and the tissues surrounding the apex of the tooth do not heal. Why has the root canal treatment been unsuccessful? There are a host of reasons why a root treatment may fail. 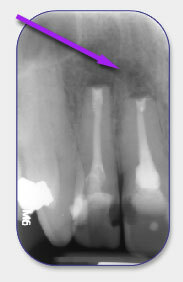 Commonly failure is associated with bacteria still residing inside the tip (apex) of the root following root canal treatment. Consequently, those persistent bacteria perpetuate the inflammation in the tissues surrounding the tip of the root. The apicectomy is performed to physically remove the tip of the root that is harbouring those persistent bacteria. Treatment protocol In most instances if a root canal treatment has been unsuccessful, the root canal treatment is performed again with a view to improving the shortcomings of the initial treatment. If this retreatment fails, then an apicectomy can be considered. An apicectomy can be performed directly, following an unsuccessful initial root canal treatment, so long as the initial root canal treatment has been expertly performed. The alternative to an apicectomy for treating a failed root canal treatment or root canal retreatment is extraction of the tooth. Leaving an infected tooth in the mouth increases the risk of an acute abscess forming, which can be very painful and harmful to the patient’s health. Ideally an infected tooth should either be treated or extracted to remove the source of infection. The aim for an apicectomy is to remove the infected root tip and affected tissues surrounding the tip of the root, thereby removing the source of the infection so that the tooth can ultimately be saved. By saving the tooth the patient is avoiding having a gap, denture, bridge or implant. What actually happens during an apicectomy? The dental procedure called an apicectomy (or root-end surgery) aims at removing the infected root tip, removing the affected tissues surrounding the root tip, preparing and then resealing the root tip. The procedure is performed under local anesthesia. This is administered 10 minutes before the start of the procedure. The soft tissue overlying the tooth is reflected back. This procedure is commonly known as ‘raising a flap’. This allows access to the root tip. The tip of the root will be surrounded by connective tissue. This tissue is physically removed using hand held instruments. 3mm of the root tip is removed using a diamond drill. The root tip is then prepared using special right-angled diamond tips. The tips are used to clean the apex of the root. Following preparation the root-end is then sealed with a root-end filling material. The flap is then repositioned and sutured into place and the tooth is x-rayed to check the quality of the root-end filling. These sutures are then removed 48-72 hours later. A tooth must be restorable to make performing the apicectomy worthwhile. Hence, the first aim of any endodontist is to assess whether or not the tooth is restorable, and this assessment is carried out at the consultation stage. Cracks are a reason why a tooth may be unrestorable. These are sometimes are only discovered following commencement of treatment. If they are discovered and are found to adversely affect the restorability of the tooth, the endodontist will then cease treatment at this point. The actual apicectomy itself is a relatively pain-free procedure. Following the apicectomy and for a few days after, the tooth can have a little ache and the associated area can feel slightly uncomfortable. There may also be some associated swelling. In most cases painkillers help greatly to minimise the discomfort and swelling felt following treatment. All patients that have had an apicectomy are encouraged to return one year later to follow-up the outcome of the treatment. 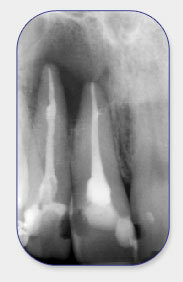 At this appointment the tooth is radiographed/x-rayed to ensure that any lesions that had been present have now healed (Figure 5). 12-month follow-up radiograph demonstrating complete healing of the tissues surrounding the tip of the root. Anatomically, the inside of the tooth can be very complex. Endodontic microscopes make surgical treatment of the root apex much easier by improving significantly the illumination and vision of the root apex. The pre-operative, post operative status and assessment of outcome relies on the use of radiographic imaging (x-rays). At Harpenden Dental Centre we use the latest digital radiographs, which provides superior image quality and are safer for the patient compared to the old film based radiographs (x-rays). These are specialised right-angled diamond instruments for creating parallel preparations in the end of the root. MTA is used in most cases to fill the end of the root. This is used for taking photographs of the root apex. This is helpful for communication of treatment to both the patient and referring dentist. Similar to the intra-oral camera, this is a very useful tool for communicating complex surgical treatments to both the patient and referring dentist. The success of any treatment cannot be guaranteed and an apicectomy is no exception to this rule. Apicectomies have an 80% chance of success. This figure is consistent provided the tooth is restorable and the existing root canal treatment is of an adequate standard.